I'll be at the February 10th Crafty Wonderland Craft Bazaar at the Doug Fir Lounge (in Portland) selling Beth Bee Books books sharing a table with my pal Meredith of NeverTwice. She'll be selling some felty sorts of things, I believe. Come out to say hello and browse or buy! 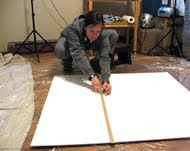 The details have been finalized, and I have begun assembling materials to start on a commission I have received by way of the ArtsCare program of the Corvallis Art Center (ArtCentric) for two large multi-panel paintings for Good Samaritan Regional Medical Center in Corvallis. The paintings will be two panoramic landscape scenes - one from north of Corvallis and one from the Alpine area south of the city. The project will be ongoing through 2008, and the paintings will eventually be hanging in the hospital's Conference Rooms A & B after remodeling/ construction is completed. I'll post updates and pictures occasionally through the year, so check back! The opening on Thursday went great! Thanks everyone who braved the rain and darkness to come out. I was pleased to see so many friends and meet some new people too! It was all very positive. The paintings will be on display through January & February!